Today was the final day of the Samsung Developer Conference, and it was a blast! This was my first time attending SDC and the past two days were a whirlwind of hands-on play, awesome new tech, and a ton of virtual reality experiences that made me even more excited about where VR is headed. Trust me, I didn’t think it was possible to be more excited than I already was. I was really impressed when Samsung announced Project Beyond at the SDC Keynote session yesterday, since there are still a lot of advances to be made with 360 video capturing. Most of the 360 degree cameras that are available today are either expensive rigs mounted around a fixed set, or are small, low-resolution devices that don’t quite cut it for an immersive VR experience. I had a chance to try out a Gear VR running a video shot with the Project Beyond prototype, and it was a really cool experience. One of the representatives there mentioned that it wasn’t playing in high resolution due to the devices, which makes sense, but it definitely showed the limitations of mobile VR – I’m waiting for the experience that is able to trick my brain into thinking it’s real, but I don’t think we’ll get there with phones for a while. Overall, the demo showed a lot of promise, and it was definitely a really cool way to capture moments. Having tried the Oculus Rift at last week’s SVVR meetup (if you’re in the Bay Area and interested, definitely check it out!) I was interested to get a chance to try out a mobile headset that was a little more immersive than my Google Cardboard and the Gear VR didn’t disappoint. The demo took an interesting perspective, with most of the scenes being filmed from a 360 degree camera hanging off of a helicopter, and I’m sure I looked ridiculous as I flew over waterfalls and got up close and personal with lions. I walked away feeling pretty impressed by the whole thing. So where does the disappointment come in? The Gear VR is priced at $199 dollars, and that’s just for the headset itself: the Note 4, which is the only phone that the Gear VR works with, is another $750 if you want to buy it off contract. Additionally, there’s a third component, the game pad, which will also add on to the overall price. Compared to the developer versions of the Oculus Rift, currently $250, this seems pretty steep given the limited processing power available with mobile VR on today’s hardware, though to be fair the Oculus Rift currently requires a fairly powerful graphics card and is wired to a PC. We’ll have to wait and see what Oculus announces for the final consumer product to get a good comparison/performance breakdown. If you’re following along with my previous blog posts, you know that I recently took the jump into learning Unity (and by recently, I mean that I’m about eight days in and totally in love) so I registered for several sessions that introduced the Oculus Mobile SDK and learned the basics of building a VR experience using Unity. It was great! 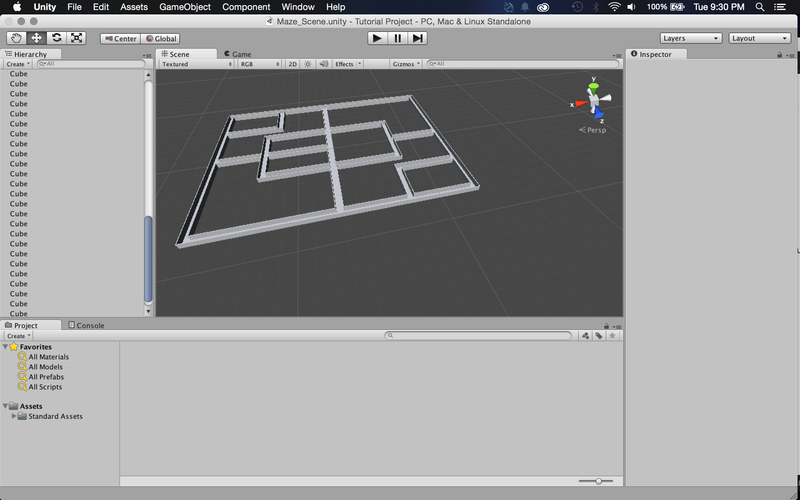 Today, I was able to get my own Unity maze game using the Oculus camera model, so my next step is to compile it and see how well I can get it to run with my Nexus 5 using my Google Cardboard. New project in the making – stay tuned! In addition to the input and research being done around VR comfort, I really found myself drawn to Altspace VR, a company working on making the virtual reality environment become more social by focusing on shared experiences. one of the experiences that I’m looking forward to most with VR is the idea of grabbing a drink with my friends and family who are all back on the east coast, and it seems like Altspace is on that! Along those lines is the research that UNC is doing with social-izing augmented reality – we had a chance to see a demo video of a multi-camera setup that allowed someone to be “projected” in a room, 3D and real time. With VR and the work of all the awesome companies that were at SDC this year, we are really living in a science fiction-esque future and I could not be more excited to see what kind of things are around at next year’s conference! Next PostGood News, Everyone! Conference Sessions, Tutorials, and a VLOG !